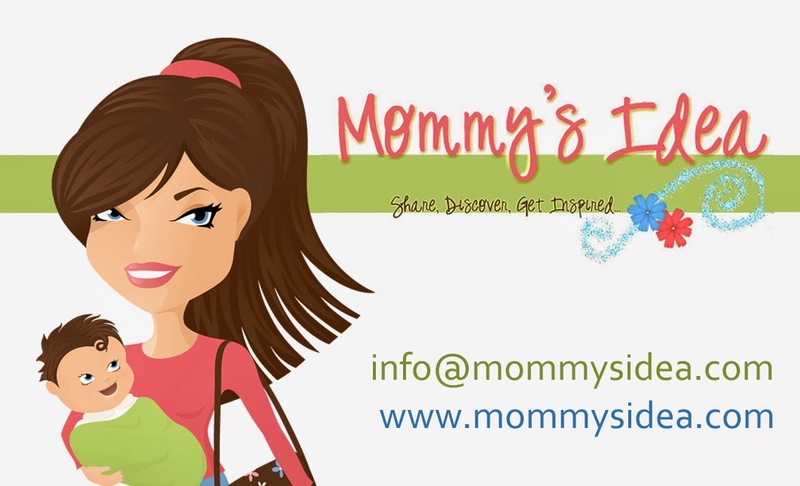 Mommy's Idea: Win a Pendant from Analiese Designs! Choose from premade pendants, custom photo pendants, or have your child’s artwork put on a necklace! 1. Check out Analiese Designs at http://analiese.etsy.com/. Contest ends at 11:59 PM EST on Wednesday, November 12, 2008. My name is Rachel – middle name Analiese – which is where my shop name and design name came from. I live in Milford, CT, walking distance to the beach - so our family just loves the water. I am married and have a beautiful 7 year old son who is the center of my life. 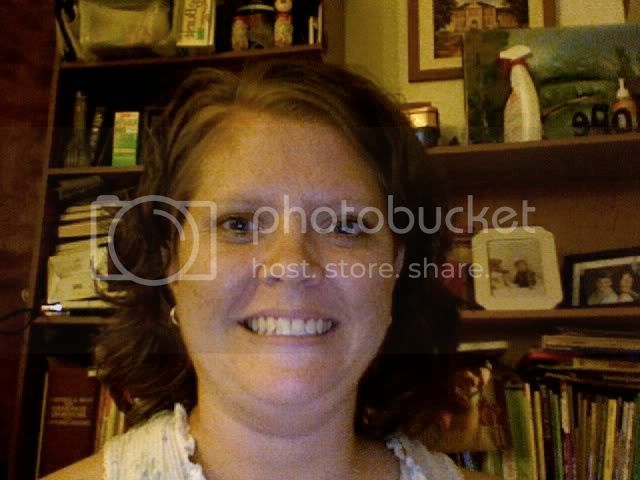 I am a certified elementary teacher, however, I am still looking for a full time teaching job. In the mean time – I teach an adult-education GED prep class and substitute teach in my town. This gives me the flexibility to continue my business. I create a variety of jewelry related items – most of which are polymer clay image pendants. I also make glass image pendants and beaded jewelry as well as some other household items such as magnets, bookmarks and more. My biggest seller, especially for the holidays, are my custom photo items made on both clay and glass. I have been featured in a catalog, and will soon be featured in an upcoming issue of Stringing magazine. I also sell my wares at a few local businesses and will be adding them to a new Art gallery opening soon. See my Etsy Shop at http://analiese.etsy.com/. It is mom-owned, invented and created J I have a pendant that is very popular for moms – the Child’s artwork pendant . This is a great way to display and wear your child’s art. I started by just making beaded jewelry and ventured into Polymer clay just to experiment. I tried a lot of image transfer techniques that never worked and discovered my technique completely by accident. It is the best accident that could have happened, since it really is my most popular item. I have had over 3,000 sales on Etsy and continue to expand my line of items as much as possible. I love being a part of the Etsy community and I feel it has helped me to become a better businesswoman and artist. I enjoy my craft and try to find as much time as possible to work on it. I like the zipper pulls. And just about everything else on the site. I REALLY like the pendant with the child's pic - but I have 3 kids, I don't think they'd fit in one. I love the custom photo necklace! I'd love to get one w/ both of my boys' newborn pictures. Such beautiful work! I already follow you :) Not sure if that counts, lol :)Thanks! I like the simple black and white, the zipper pulls and the children art transfer. I love the simply black and white. i can see it going with almost everything i own. so cute. I love the Moonlight Owl - Glass Tile Pendant. I absolutely adore the Bella Blue Victorian glass tile pendant - so beautiful!! That would definitely be my pick. I like the Bella Blue Victorian - Glass Tile Pendant. Great giveaway, thanks! I just love the How Sweet gray kitten pendant. Those is so adorable! Thank you so much! i like the rustic bird one - great products!! The Tree of Life Pendant is my favorite item! The painted cardinal is my favorite pendant (reminds me of charley harper illustrations).. but it's hard to pick I really like a whole lot of them. The children's artwork idea is brilliant. I might have to do it! I love the Japanese garden pendent. They are all so wonderful but my favorites have to be Every Time a Bell Rings and Santa's Surprise (guess I'm in the holiday mood? LOL!). I am also an e-mail subscriber to your blog. I LOVE the custom photo pendant! I want one so badly. I HOPE I WIN! I am not sure if I can wait until the contest is over, I may be heading over now to purchase one. THANKS! 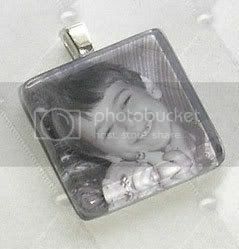 I would love to carry around my son in the Custom Photo pendant. I am in LOVE. Bye, bye Paypal balance! I love the Your Childs Art on Clay - Polymer Clay Pendant. I love all the photo pendants. What an opportunity to show off your kids! I like the Custom Photo Glass Tile Magnet Set. I love the custom photo glass tile necklace - I may have to order one for a christmas present to myself! Dragonfly At Dusk - Necklace is absolutely breathtaking. I collect all things with butterflies and dragonflies on them! I adore the chocolate can't get your pregnant pendant! my favorite is the How Sweet - Polymer Clay Pendant thanks for this great contest, such beautiful pendants! I like the Sidewinder Pendent! I love all the sixites and seventies pattern pendants, especially sidewinder. I would love to have a custom photo pendant. I love everything on this site. I love the joy to the world pendant. Very pretty! I like the Live your Dream necklace! I like Bird Upon A Swirl - Glass Tile Pendant. i would looooooooooooove to win the sidewinder glass pendant! The Japanese Garden pendant is my fave.I am a subscriber. I love the Taking Flight - Glass Marble Earrings. I love the rustic bird. I'd love a bunch of her things, actually! i love everything almost but i really dig the japanese garden pendant. i will come back and check out more. I'm a Halloween junkie and I really love the "Spooky Bats-Glass Tile Pendant". I'd probably wear it year-round since it's just that cool-looking! I love the child's art on clay pendant. I'd want to give it to my mom - if she could figure out a way to make clothing out of my daughter's artwork, she'd be wearing it every day! I love her Dragonfly at Dusk necklace, lovely. Thank you! Thank you for having this. I would love to win. I really like the custom photo pendant. Thank you! I love the Bella Blue Victorian Glass tile pendant. I also really like the custom photo pendant. I like the dragonfly at dusk necklace. I love the Floral Whimsy - Polymer Clay Pendant. Cute stuff! I really love the "Custom Photo Pendant on Polymer Clay - 2 Inch Round", they are affordable, and cute...I might get one for my mama or just keep it for myself!!! I would love to have the custom photo pendant with my little girls photo in it. I love those glowing jellies pendant. I like the Japanese garden clay pendant and the red and gold glass pendant. I think the Nightingale - Polymer Clay Pendant is really pretty. I like the royal swirls glass pendant, I love the colour! Skulls and roses would be a great gift for my teenage daughter. I really like the Vintage Dandelion Glass Tile Pendant-so,so pretty! I'm a bird girl.... Rustic bird brings a smile on my face!It also gives such a soft touch. Pink Paisley - Glass Tile Pendant is my favorite. Thanks! I really like the Pretty Peacock feather glass pendant! Thanks! Joy to the World Polimer Clay Pendant is my favorite for sure...love it...thanks! I love the photo jewelry. But one of my favorites is the Pretty Peacock Feather - Glass Tile Pendant. Very pretty. My daughter would love the Skulls and Roses - Glass Tile Pendant. Myself, I would like a pendant made from my child's artwork. I found her website a couple of weeks ago. I was amazed at what great prices she was offering. I ordered a pendant with the art work that my daughter had made. The pendant IS AWESOME!!! I will be ordering more for Chrsitmas presents for the Grandparents. Such great stuff, that Etsy store was already listed in my favorites :) Love her stuff. I'd pick the Custom Photo Glass Tile Braclet, it would be a great gift for my Mother. I love the vintage dandelion pendant. Wow, this was a hard choice! I think the orange owl is my favorite pendant - he makes me laugh. I love the Japanese Garden Pendant. I'd love to have that or one of the custom photo necklaces. I like the Pumpkin Head - Polymer Clay Pendant. I just love the Pretty Peacock Feather - Glass Tile Pendant!! We have Peacocks here and this is gorgeous! I absolutely love the Pumpkinhead pendant. I'm very into Halloween, particularly vintage Halloween art and items. This is so cute! the Bella Blue Victorian glass tile pendant - so beautiful!! I love the Bird Upon A Swirl - Glass Tile Pendant! I also like custom photo necklace! I will give it to my sister so she can put his son's picture on it. Really nice! I have a couple of favorites, but I'm going to go with Lotsa Circles tile pendant. These are all so pretty! Thanks for the giveaway! I like the Joy to the World clay pendant. I also like that she's selling a tutorial on how to transfer pics to clay. Thanks! my favorite is the tree of life clay pendant! I love, love, love the How Puzzling pendant. A couple of yrs ago, I created a crossword puzzle with all the names of everyone in my family and use it as the image on our family's Yahoo group (can be seen here if anyone is intrested - http://groups.yahoo.com/group/DeWitts_Digest/). I would love to have a matching (of sorts) pendant. Thanks for offering this wonderful giveaway! Good luck to everyone! I like everything there...but this is my favorite...Custom Photo Pendant - With Sterling Silver Bail is without a doubt a great product. I like the sidewinder pendant! But all the acrylic pendants are amazing! And last but not least, I stumbled you too! Thanks again for this wonderful giveaway and good luck to everyone who entered! The Custom Photo Glass Tile Bracelet. I like the Midnight in Paris Earrings. love the simplicity of the custom photo pendents. Thanks for the chance to win!! I love the How Puzzling - Customized Name Polymer Clay Pendant! I love the Owl Family - Glass Tile Magnet Set!! I really like personal photos so my favorite is the the Custom Photo Gift Set. Thanks! I like the custom tin and necklace. Thanks! I love that polka dot bird pendant, reminds me of the twitter bird logo. Love it! I would probably pick Skull and Roses or Japanese Garden as my favorites! Omg I love the Every Time a Bell Rings.... - Polymer Clay Pendant. :D So cute. I love the Shabby Chic Kitty - Glass Tile Pendant & the Skulls and Roses - Glass Tile Pendant. I love the Stormy Snowman Glass Tile Pendant!! So cute! Great giveaway - thanks for offering it! what a neat etsy shop! i really like the Light My fire pendant. The Stormy SNowmen pendant is too cute! Oh, I have so many favorites!!! Okay, two of them are the Stormy Snowman and the Shabby Chic Kitty!! I like the taking flight earrings! I love the live your life necklace! Lots of really nice things in this store! Thanks for the great giveaway! I love the I Have a Little Dreidel - Glass Tile Pendant. It's rare to find a nice Jewish pendant, thanks! Wow! I love the Peacock Feather - Glass Tile Pendant. It is brilliant! If i win, can i pls have the "Pretty Peacock Feathers - Large Round Polymer Clay Pendant"
i am also subscribed to ur blog. I would love a custom photo pendant. I also like the polka dot bird clay pendant. i love the child's artwork pendant. I really like the Polka Dot Bird - Large Round Polymer Clay Pendant. It's so hard to pick a favorite! I liked the Japanese Garden pendant (we'll call tha tmy favorite if I have to pick one), but I also liked the pink chic kitty and I really love the idea of putting the children's artwork onto jewelry as well! Earth and Sky Paisley - both the pendant and earrings are just lovely - perfect for casual wear. Her stuff is just pretty. I will be ordering the Custom Photo Gift Set - Pendant, Chain and Matching Tin for holiday gifts for my mom and mother in law. These are perfect to commemorate our baby's first year! I love that it comes with the Tin, that's a great extra little gift. I can't wait for my son to be old enough to draw, I'll be making an artwork bracelet soon!! I love the vintage crystal earrings. My favorite is the Orange Owl - Glass Tile Pendant! I like the Snowman Acrobats - Polymer Clay Pendant. Thank-you. Holy mackerel! What interesting pieces. I'm torn between the Ouija Board necklace and Scattered Daisies glass pendant. I will definitely be doing some of my holiday shopping here. I the custom pendant necklace! I LOVE the Every Time a Bell Rings.... - Polymer Clay Pendant!! One of my favorite movies! Thanks for sharing! I love the Twilight Bird - Glass Tile Pendant, the blend of colors that were used are beautiful. I really like the pendant of the artwork. My son has been a very artistic child sine the age of 11 months. At 13 months he started grasping pencils and crayons and drawing circles and squares non stop!! No joke, so now that he's five, I have TONS of artwork from him. I would absolutely love to actually wear something he's drawn for me! Good luck everyone & thanks for this wonderful opportunity! I like the Fairy Tell Owl glass tile pendant. It is so cute! 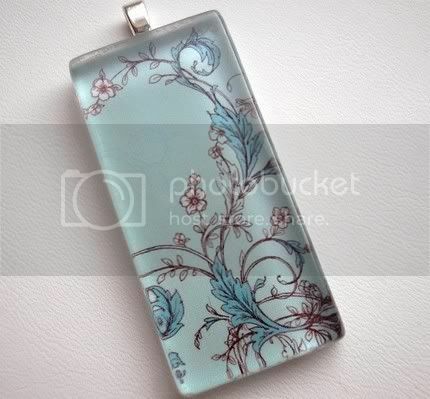 the Kiwi Floral - Glass Tile Pendant is so lovely! Christina - xristya@rock.com - My favorite item is Analiese's Stunning Vintage Necklace In Gold And White - very old-fashioned and statuesque, and would stand out at any event!